Hello, CarbonWA friends: Read on for some updates as we look back and begin to look ahead. The strongest base of support for I-732 came from liberal strongholds, particularly in Seattle. It also looks like every majority-minority census tract in King County strongly supported I-732. I-732 did not win enough support from conservative voters despite picking up late support from conservative political leaders. Where we campaigned the hardest, we performed well. Parts of Whatcom, Thurston, and Pierce Counties, the San Juans, Bainbridge Island, and Central and South Seattle all showed resounding support for climate action. The work we did together established a political base for climate action that can be built on. We are still filled with pride for all we’ve done and gratitude that we’ve been able to do it together. We ran a campaign funded and run primarily by volunteers and citizens, showing Washington and the nation that there is a dedicated, mobilized constituency demanding action on climate change. So, if you need a pick-me-up take another look at our last email blast to see the highlight reel of our work so far. If you have more thoughts or feedback on the election and what we should do next, please share them via email. Contact us at communications@carbonwa.org, and visit this page to see the (anonymized) feedback we’ve received so far. Write your legislator! While its likely that this session will be dominated by school funding, that doesn’t mean we should give the legislature a free pass on climate change. You can write directly to your legislator through this webform to urge them to price carbon NOW. 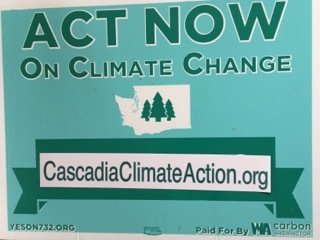 Executive Committee member Greg Rock will be in Olympia semi-regularly, so you can email him at greg@carbonwa.org if you want to connect, join him for a hearing, or get some help setting up a meeting with your legislator. Modify your yard sign and leave it up! 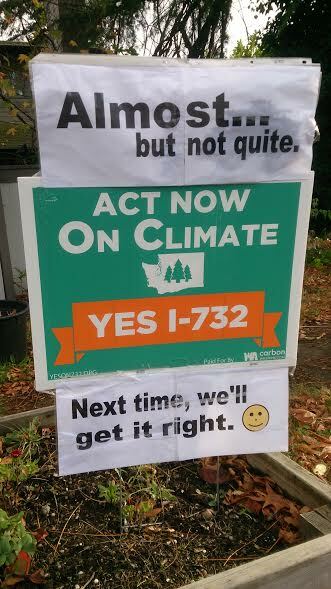 See a couple of photos below of supporters who want to keep reminding their neighbors that we need climate action. We’ve had people writing in to suggest re-purposing yard signs as anything from a clipboard to a bicycle fender. Get creative and send us the photo! Why climate change divides us – CS Monitor – thoughtful exploration of tribal nature of climate debate. There will never be a better time to save the planet – Medium – call to arms by futurist Alex Steffen. Cites I-732 as sign of hope, despite not passing. Renewable energy is seeping into small-town America – Vox – David Roberts – some positive general climate news! We didn’t get a carbon tax over the finish line in 2016, but we moved climate action a heck of a long ways down the field. In the wake of this election, its clear that Washington must lead on climate and that any solution must reach out across party lines to have a chance to succeed. But, just like a real halftime, we are taking some time to rest, analyze, adjust, and chart a path for a second half that ends in a win. We hope you’ll join us in staying tuned in, sharing your thoughts about the road ahead, and in taking some time to cherish our family, friends, and the planet. Happy Holidays from the whole Carbon Washington team! Legislator survey and carbon tax in proposed 2017 budget!